In 1997, Adam Vallance and Laurie Heide were busy hiking and paddling the areas around the Powell River region – including Desolation Sound and Toba Inlet – in anticipation of setting up an outdoor business. It was at this time that a conversation surfaced regarding the sale of Powell River Sea Kayak. What timing! By December of 1997, negotiations were completed and Powell River Sea Kayak had been sold to the proud new owners. That year, Adam and Laurie ran the business right out of their home in the old Townsite of Powell River. Many of the company’s systems continued, including the delivery of rental kayaks to launch sites north of Powell River. In addition, a new segment of the business had been marketed: Multi-day tours in Desolation Sound. As these four day tours booked in, it became evident that the business was sorely understaffed. While Adam and Laurie were out leading kayak tours, family members were getting a first hand experience at maintaining a booming sea kayak business. By the end of the season, Adam and Laurie new it was time to move the business out of their home and into a commercial setting. In 1999, Powell River Sea Kayak moved to a new retail section in Powell River. 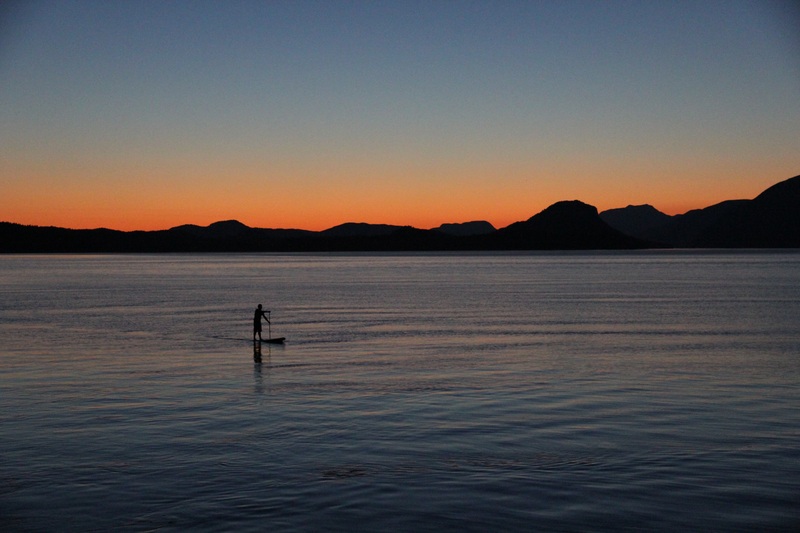 Although this venture solved one problem – getting the business out of the house – Powell River Sea Kayak still had to offer a kayak delivery service between Powell River and Lund/Okeover. In addition, the added commitment to a retail store pushed the envelope further – even with the addition of office/retail staff and a full-time guide. Despite the pressures of a new and ever expanding business, Powell River Sea Kayak was named Business of the Year at the annual Horizon Business Award. With an ever increasing demand from people looking to rent kayaks and take guided trips into Desolation Sound Marine Park, it was time to shift the businesses into the next gear: close down the retail store and move to Okeover Inlet! The search started for a waterfront site that would satisfy a variety of needs: proximity to Desolation Sound, ample parking, basic infrastructure. The search seemed fruitless. Finally however, the realtor called with an interesting property; a waterfront location on Okeover Inlet had come up for sale. Upon closer inspection it seemed to good to be true! With unbelievable access for paddling Desolation Sound Marine Park, there were two outbuildings at the water: one which would act as an office and the other as a kayak shop, there was plenty of room for parking and it even had an old cabin. An offer was made and Powell River Sea Kayak had a new home: Penrose Bay on Okeover Inlet – once home to the Cougar Queen of Okeover. Not only did Powell River Sea Kayak have a new home, but Laurie and Adam did as well. After a winter wedding in December of 1999, Adam and Laurie began renovations of the old cabin on December 27 and moved in January 31, 2000. The 2000 season for Powell River Sea Kayak was a treat for both the owners and the customers. With no more need to transport kayaks, a great deal of time and energy was saved. Day tours were fine tuned to offer clients more detailed interpretation. Multi-day tours were expanded into Toba Inlet, Hotham Sound and Jedediah Island – along with the popular Desolation Sound. More staff were brought on to handle the demand and to provide the best customer service possible. By 2002, Powell River Sea Kayak’s “Desolation Launch Site” had become well known as a key staging location for trips into Desolation Sound. When an opportunity presented itself to set up a kayak shop at the Lund Hotel that year, an excellent staging area for trips to Savary Island, the Copeland Island Marine Park and Desolation Sound, it was a no brainer. Rockfish Kayak was opened in the spring and Powell River Sea Kayak was well on it’s way to establishing itself as one of the premier sea kayak companies on the West Coast of British Columbia. In the intervening years, PRSK continued to develop and grow its sea kayak touring operations and rental fleet. Tenures were obtained and systems dialed to give guests the best possible experience. Guides, staff and guests returned year after year due to the positive company culture and attention to detail, safety and comfort that our trips strive to achieve. It was this passion for customer satisfaction and comfort that led to the planning, application, and ultimately the construction of Cabana Desolation Eco Resort, the only eco-resort in Desolation Sound. The first application for upgrading an existing commercial tenure on Kinghorn Island to prepare for the construction of Cabana Desolation was in 2008. Yet it was not until the summer of 2011 that the go-ahead was officially given and work could proceed. In the intervening years, plans had evolved from a comfortable ‘basecamp’ for PRSK camping tours, to the idea of semi-permanent ‘yurts’ in the rainforest, to the final design of west coast ‘cabanas’ inspired by the eco-lodgings of Costa Rica, but with a local twist. The discovery of a small but consistent natural spring allowed for the development of even more comforts. Hot showers, flush toilets and a fully stocked commercial kitchen were not previously thought possible in our remote island environment! Work started in the fall of 2012, and continued slowly but surely through until the spring of 2014. Cabana Desolation officially opened for our first guests in mid-July of that same year. During this time there were numerous challenges and delays. All the materials for building were brought out piece-by-piece on the company motor vessel, for one. Government imposed shutdowns for various bureaucratic decisions was the source of another delay. However, work eventually continued, and the dream edged closer to becoming reality. What followed was a completely hand-designed and hand-crafted eco resort. More than 25 individuals participated in the construction process in one way or another. Many of these workers still work for the company in various positions today. When you visit Cabana Desolation Eco Resort you can truly sense the hard work, dedication and vision that went into its creation. It is this vision and commitment that continues to drive the product and PRSK forward into the future. Cabana Desolation opened in 2014 with a maximum capacity of only 6 guests. Since that day, we have constructed 2 further guest cabanas to bring that total capacity up to 10-12 guests. This mirrors our multi-day camping tours and allows our staff to provide a level of genuine service and experience that is rare among other resorts and sea kayak companies. Despite the success and growth of the company, PRSK has never abandoned its roots as a family-run sea kayak business. Adam, Laurie and their two children are still heavily involved in every facet of the operations of the company – from talking to prospective guests through to preparing baked goods and bulk items for our camping tours and maintaining the smooth logistical flow of the resort. Today, during the summer months PRSK and Cabana Desolation employs approximately 20 local employees with a passion for the outdoor industry in a variety of positions, from guides to general operations to eco-resort cooks. Looking ahead there are many plans afoot to continue this growth and focus on what’s genuine, local, and quality in everything we do.